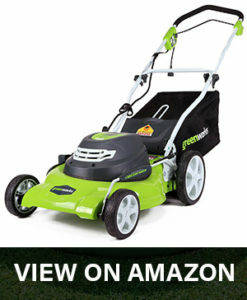 You have heard all about electric mowers, but they can be a little on the pricier side. Also, what do you do if you have a tiny lawn, and just need something that’ll get the job done in less than 20 minutes? 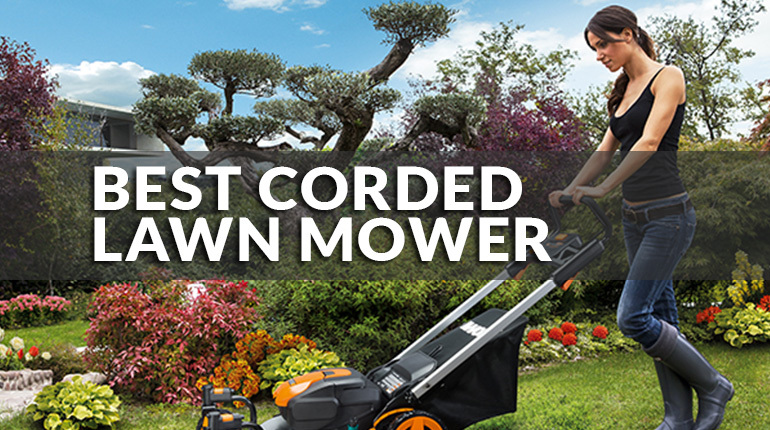 Once again, we have the answer for you-get the best corded electric mower possible. Today we will walk you through the corded electric mower space, and give you some of the best lawn mowers. You’ll be mowing in no time! It is simply a traditional electric mower, but instead of deriving its source of electricity from battery packs, it requires a power cable that goes into a wall outlet or electrical generator. In general, corded mowers tend to be smaller because using an extra long extension cord isn’t practical. Other than the use of a cord there is not much difference between these and traditional electric lawn mowers. We are going to start with our favorite choice, because this is what corded mowers should aspire to. The cutting deck is made of steel, and very wide at twenty inches. These quality features are matched by careful attention to comforte. The handle is pleasantly curved into the shape of the letter “V,” there are tiny steel bearing inside the wheel to make it turn more smoothly, and there is a single lever to control the overall height. There are only a few minor gripes. The first is that the quality of the blade is uncertain. Some people have complained about it. On the other hand, when the blade is in good condition its mulching abilities are exceptional. Additionally, the back flap of the mower can potentially be caught in the blade when you pull the mower backwards. If this occurs it may nick the blade slightly, and slice up the rubber flap. This is a pretty capable mower with some nice features namely a steel cutting deck and caster wheels. This sturdy deck complements the sharp blades and helps ensure an even and clean cut. The caster wheels are big and well treaded which makes them excellent at navigating tougher ground. The problem with the wheels is that they are sometimes hard to steer, and they extend past the side of the mower making it challenging to mow up against items like fencing. This is the same mower as its battery pack brother minus some of the nicer features such as the safety key, and front headlights. 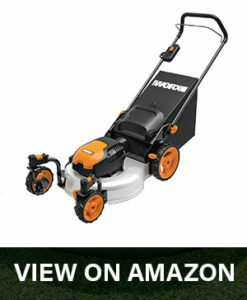 It is a dependable mower for the money, and definitely not a regrettable purchase. One convenient feature is that the handle completely collapses, so you can easily store the mower under something low. Small Yard: Corded mowers are best for people who have smaller yards. It would be extremely difficult to mow a large lawn if you have to simultaneously handle a couple hundred feet of power cord. With a small yard the inconvenience of having a cord is not as great, because you will never be that far from the power outlet the cord is plugged into. 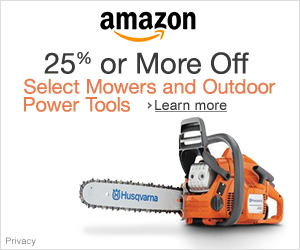 Inexpensive: These are some of the most affordable lawn mowers for the money. It is not worth it to buy a large and expensive lawn mower if you have a large lawn, so these smaller machines fit the bill. Even if you don’t have a small lawn it is a good idea to save money where you can, but if you mow your lawn frequently it might not be the best to cheapen out on your lawnmower. You should spend money on things you will be using a lot, and the annoyance of using a corded mower on a large lawn is just not worth the minimal savings in money. Especially considering you can pay around $100 more and get a decent gas push mower. Light: One of the sources of weight on battery pack powered mowers is the battery. By eschewing batteries the corded electric mowers save weight, and are quite light by comparison. Inconvenient: Some people don’t mind mowing while dealing with power cable management, but they are definitely the minority. There are extra hazards involved with mowing while dealing with a cord: running over the cord, tripping, pulling the cord out of the wall socket by accident-the list goes on. On smaller lawns the above problems are definitely mitigated, but nonetheless still present. There is not much space for differentiation in terms of crowning a best corded electric mower, but in this case the complete package of the Earthwise makes it the winner. 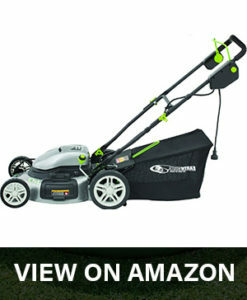 It is on the pricier side, so you will have to weigh whether it is worth it to purchase a corded mower at that price. Overall, you would probably be happy with any of the above decisions. We hope that you have a basic understanding of the niche’s offerings. If you would like to learn more in-depth information on any of the above mowers (or more) check out some of the other reviews on the website. Merry Mowing! If you want to learn more about mowers, read the best reel mower.